Home > Blog > When is a Pedestrian at Fault in a Car Accident? On average, a pedestrian is injured every eight minutes in traffic crashes across the United States. These accidents are often serious and result in lifelong injuries and permanent disabilities to pedestrians who are involved. Unlike many types of car accidents, however, pedestrian accidents are often complex and sometimes there is additional confusion as to who is truly to blame for the crash. In some cases, both the pedestrian and the driver may share blame for the accident and the injuries that resulted. When this occurs, who pays for medical expenses, lost wages, and pain and suffering? 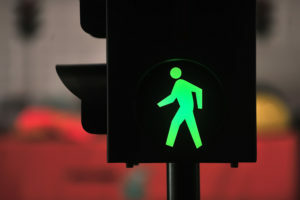 What Options Do I Have for Getting Compensation After a Pedestrian Accident? If you’ve been injured in a pedestrian accident, you have two main choices when seeking compensation. You can file an insurance claim with the “at fault” driver’s insurance liability policy or you can file a personal injury lawsuit. Immediately after you are injured, however, you will likely get your medical bills paid by your own medical insurance provider. It will then be up to your medical insurance company to collect reimbursement from the responsible auto insurance company. When seeking compensation from the “at fault” driver’s insurance company, your attorney must establish negligence prior to collecting the money you need. The driver’s insurance company will pay out in accordance with their policy limits. If the driver doesn’t have enough insurance or if your expenses exceed the policy limits, you may have to file a personal injury lawsuit to collect the money you need. A personal injury lawsuit is also an option when the insurance company offers you too low of a settlement to cover your expenses. Once you file a personal injury lawsuit, your attorney will negotiate with the insurance company to settle your case out of court. Most settlements occur without ever having to go to court, but with legal representation, injured pedestrians are often able to collect significantly more for their injuries. If your case does proceed to court, you can rest assured knowing that the Arkansas pedestrian accident attorneys at Rainwater, Holt & Sexton are ready and willing to fight for you in court. While every attempt is made to settle your case outside of court, we prepare every case as if it might be going to trial. Duty of Care – Your attorney must show that the driver of the vehicle owed you a duty of care. That means that the driver needed to drive responsibly and obey all rules of the road in order to ensure the safety of all those around them. This includes checking mirrors, looking before backing out of a parking space, not drinking and driving, and avoiding distractions. Breach of Duty – Your attorney must also show that the driver breached this duty of care. This means that they failed to drive responsibly, such as speeding, weaving in and out of traffic, or texting and driving. Causation – Your attorney must also clearly establish that this breach of care directly caused your accident and your injuries. In the case of a texting driver, the driver must have been texting and driving and then hit you with their car. Damages – Your attorney must also show that you sustained injuries or damages. If the driver hit you with your car and you broke your arm and suffered head injuries, then you would clearly have sustained injuries that need to be compensated for. Emotional injuries, such as PTSD, depression, and pain and suffering also count as damages. At Rainwater, Holt & Sexton, our Arkansas pedestrian accidents work around the clock to build the strongest cases for our injured clients. We know the importance of proving fault after a pedestrian accident. That’s why we investigate the case diligently from the start by interviewing all eye witnesses, reviewing medical records, obtaining police reports, and employing accident reconstruction experts when needed. While drivers have a responsibility to use extra caution when driving in areas with pedestrians, pedestrians also have a responsibility to use caution when crossing the street. Sometimes the driver and the pedestrian share the blame for the accident, such as if a driver of a car turns right and hits an intoxicated pedestrian. When this occurs, it’s critical to have an attorney representing you during the legal process. Without an attorney on your side, the accident may be blamed on you and you may shoulder more of the legal fault than necessary. In car accidents, pedestrians are sometimes to blame for their accidents and their injuries. However, the vast majority of pedestrian accidents are caused by other drivers who are driving recklessly, negligently or distracted. When this occurs, it’s important to contact an experienced Arkansas pedestrian accident attorney as soon as you are able. Your attorney can protect your rights to recover the money you need to put your life back together again after a serious pedestrian accident. Contact Rainwater, Holt & Sexton Pedestrian Accident Lawyers today. Fill out a free contact request form, which only takes a minute, or simply dial (800) 767-4815 and we can get to work for you.